Nikita Sergeyevich Mikhalkov (Russian: Ники́та Серге́евич Михалко́в; born 21 October 1945) is a Russian filmmaker, actor, and head of the Russian Cinematographers' Union. Mikhalkov was born in Moscow into the distinguished, artistic Mikhalkov family. 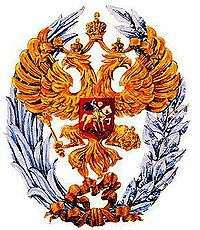 His great grandfather was the imperial governor of Yaroslavl, whose mother was a princess of the House of Golitsyn. Nikita's father, Sergei Mikhalkov, was best known as writer of children's literature, although he also wrote lyrics to his country's national anthem on three different occasions spanning nearly 60 years – two different sets of lyrics used for the Soviet national anthem, and the current lyrics of the Russian national anthem. Mikhalkov's mother, poet Natalia Konchalovskaya, was the daughter of the avant-garde artist Pyotr Konchalovsky and granddaughter of another outstanding painter, Vasily Surikov. Nikita's older brother is the filmmaker Andrei Konchalovsky, primarily known for his collaboration with Andrei Tarkovsky and his own Hollywood action films, such as Runaway Train and Tango & Cash. Mikhalkov studied acting at the children's studio of the Moscow Art Theatre and later at the Shchukin School of the Vakhtangov Theatre. While still a student, he appeared in Georgi Daneliya's film I Step Through Moscow (1964) and his brother Andrei Konchalovsky's film Home of the Gentry (1969). He was soon on his way to becoming a star of the Soviet stage and cinema. While continuing to pursue his acting career, he entered VGIK, the state film school in Moscow, where he studied directing under film maker Mikhail Romm, teacher to his brother and Andrei Tarkovsky. He directed his first short film in 1968, I'm Coming Home, and another for his graduation, A Quiet Day at the End of the War in 1970. Mikhalkov had appeared in more than 20 films, including his brother's Uncle Vanya (1972), before he co-wrote, directed and starred in his first feature, At Home Among Strangers in 1974, an Ostern set just after the 1920s civil war in Russia. Mikhalkov established an international reputation with his second feature, A Slave of Love (1976). Set in 1917, it followed the efforts of a film crew to make a silent melodrama in a resort town while the Revolution rages around them. The film, based upon the last days of Vera Kholodnaya, was highly acclaimed upon its release in the U.S.
Mikhalkov's next film, An Unfinished Piece for Player Piano (1977) was adapted by Mikhalkov from Chekhov's early play, Platonov, and won the first prize at the San Sebastian Film Festival. In 1978, while starring in his brother's epic film Siberiade, Mikhalkov made Five Evenings, a love story about a couple separated by World War II, who meet again after eighteen years. Mikhalkov's next film, Oblomov (1980), with Oleg Tabakov in the title role, is based on Ivan Goncharov's classic novel about a lazy young nobleman who refuses to leave his bed. Family Relations (1981) is a comedy about a provincial woman in Moscow dealing with the tangled relationships of her relatives. Without Witnesses (1983) tracks a long night's conversation between a woman (Irina Kupchenko) and her ex-husband (Mikhail Ulyanov) when they are accidentally locked in a room. The film won the Prix FIPRESCI at the 13th Moscow International Film Festival. In the early 1980s, Mikhalkov resumed his acting career, appearing in Eldar Ryazanov's immensely popular Station for Two (1982) and A Cruel Romance (1984). At that period, he also played Henry Baskerville in the Soviet screen version of The Hound of the Baskervilles. He also starred in many of his own films, including At Home Among Strangers, A Slave of Love, and An Unfinished Piece for Player Piano. Incorporating several short stories by Chekhov, Dark Eyes (1987) stars Marcello Mastroianni as an old man who tells a story of a romance he had when he was younger, a woman he has never been able to forget. The film was highly praised, and Mastroianni received the Best Actor Prize at the 1987 Cannes Film Festival and an Academy Award nomination for his performance. Mikhalkov's next film, Urga (1992, a.k.a. Close to Eden), set in the little-known world of the Mongols, received the Golden Lion at the Venice Film Festival and was nominated for the Academy Award for Best Foreign Language Film. Mikhalkov's Anna: 6–18 (1993) documents his daughter Anna as she grows from childhood to maturity. Mikhalkov's most famous production to date, Burnt by the Sun (1994), was steeped in the paranoid atmosphere of Joseph Stalin's Great Terror. The film received the Grand Prize at Cannes and the Academy Award for Best Foreign Language Film, among many other honours. To date, Burnt by the Sun remains the highest-grossing film to come out of the former Soviet Union. In 1996, he was the head of the jury at the 46th Berlin International Film Festival. Mikhalkov used the critical and financial triumph of Burnt by the Sun to raise $25 million for his most epic venture to date, The Barber of Siberia (1998). The film, which was screened out of competition at the 1999 Cannes Film Festival, was designed as a patriotic extravaganza for domestic consumption. It featured Julia Ormond and Oleg Menshikov, who regularly appears in Mikhalkov's films, in the leading roles. The director himself appeared as Tsar Alexander III of Russia. The film received the Russian State Prize and spawned rumours about Mikhalkov's presidential ambitions. The director, however, chose to administer the Russian cinema industry. Despite much opposition from rival directors, he was elected the President of the Russian Society of Cinematographers and has managed the Moscow Film Festival since 2000. 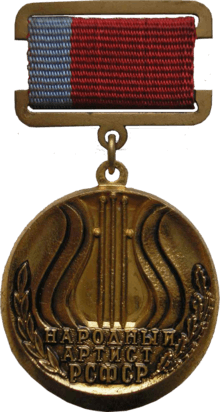 He also set the Russian Academy Golden Eagle Award in opposition to the traditional Nika Award. In 2005, Mikhalkov resumed his acting career, starring in three brand-new movies – The Councillor of State, a Fandorin mystery film which broke the Russian box-office records, Zhmurki, a noir-drenched comedy about the Russian Mafia, and Krzysztof Zanussi's Persona non grata. In 2007, Mikhalkov directed and starred in 12, a Russian adaptation of Sidney Lumet's court drama 12 Angry Men. In September 2007, 12 received a special Golden Lion for the “consistent brilliance” of its work and was praised by many critics at the Venice Film Festival. In 2008, 12 was named as a nominee for Best Foreign Language Film for the 80th Academy Awards. 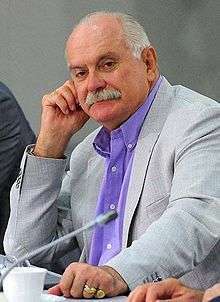 Commenting on the nomination, Mikhalkov said, "I am overjoyed that the movie has been noticed in the United States and, what's more, was included in the shortlist of five nominees. This is a significant event for me." He also served as the executive producer of an epic film 1612. Mikhalkov presented his "epic drama" Burnt by the Sun 2 at the 2010 Cannes Film Festival, but did not receive any awards. The film was selected in 2011 as the Russian entry for the Best Foreign Language Film at the 84th Academy Awards. Mikhalkov's first wife was renowned Russian actress Anastasiya Vertinskaya, whom he married on 6 March 1967. They had a son, Stepan, born in September 1966. With his second wife, former model Tatyana, he had a son Artyom (born 8 December 1975), and daughters Anna (born 1974) and Nadya (born 27 September 1986). Mikhalkov is actively involved in Russian politics. He is known for his at times Russian nationalist and Slavophile views. In October 2006, Mikhalkov visited Serbia, giving moral support to Serbia's sovereignty over Kosovo. In 2008, he visited Serbia to support Tomislav Nikolić who was running as the ultra-nationalist candidate for the Serb presidency at the time. Mikhalkov took part in a meeting of "Nomocanon", a Serb youth organization which denies war crimes committed by Serbs in the 1992–99 Yugoslav wars. In a speech given to the organization, Mikhalkov spoke about a "war against Orthodoxy" wherein he cited Orthodox Christianity as "the main force which opposes cultural and intellectual McDonald's". In response to his statement, a journalist asked Mikhalkov: "Which is better, McDonald's or Stalinism?" Mikhalkov answered: "That depends on the person". Mikhalkov has described himself as a monarchist. Mikhalkov has been a strong supporter of Russian president Vladimir Putin. In October 2007, Mikhalkov, who produced a television program for Putin's 55th birthday, co-signed an open letter asking Putin not to step down after the expiry of his term in office. Mikhalkov's vertical of power-style leadership of the Cinematographers' Union has been criticized by many prominent Russian filmmakers and critics as autocratic, and encouraged many members to leave and form a rival union in April 2010. Since 2015 Mikhalkov is banned from entering Ukraine because of his support for the 2014 Russian annexation of Crimea. ↑ "13th Moscow International Film Festival (1983)". MIFF. Archived from the original on 7 November 2013. Retrieved 2013-02-08. ↑ "Festival de Cannes: Dark Eyes". festival-cannes.com. Retrieved 2009-07-19. ↑ "Berlinale: 1996 Juries". berlinale.de. Retrieved 2012-01-01. ↑ "Festival de Cannes: The Barber of Siberia". festival-cannes.com. Retrieved 2009-10-11. ↑ "Hollywood Reporter: Cannes Lineup". hollywoodreporter. Archived from the original on 22 April 2010. Retrieved 2010-04-16. ↑ ""Цитадель" Михалкова выдвинута на "Оскар"". Penza. Retrieved 2011-09-19. ↑ Михалков: "Я приехал, чтобы поддержать сохранение Косова в составе Сербии"
↑ Ragozin, Leonid (21–27 January 2008). "Точка невозврата". Russian Newsweek. 4 (178). Archived from the original on 11 February 2009. Retrieved May 14, 2009. Михалков прищурился еще хитрее и нанес главный риторический удар: «Потому что православие – это основная сила, противостоящая культурному и интеллектуальному макдоналдсу»...Вдруг из зала раздался провокационный вопрос: «А что лучше – макдоналдс или сталинизм?» – «Ну это кому как», – ответил сын лауреата Сталинской премии. ↑ Великое интервью о великом кино. Kommersant.ru. 2010-05-11. ↑ Bayer, Alexei (March 24, 2008). "Sympathy for the devil". The Moscow Times. Retrieved March 24, 2008. ↑ "Opponents of Nikita Mikhalkov to Found Alternative Union of Cinematographers". Russia-ic.com. 2010-04-19. Retrieved 2013-10-13. Larsen, Susan (Autumn 2003). "National Identity, Cultural Authority, and the Post-Soviet Blockbuster: Nikita Mikhalkov and Aleksei Balabanov". Slavic Review. 62 (3): 491–511. doi:10.2307/3185803. JSTOR 3185803. Wikimedia Commons has media related to Nikita Mikhalkov.